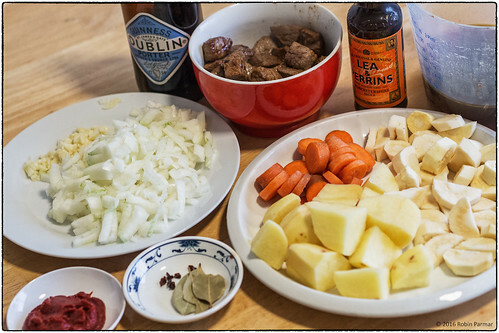 All you have to do to start an argument is to bring up the topic of "traditional" Irish stew. Everyone will think they have the correct version, usually based on what their mother cooked. But of course there is no permanent tradition. A stew is any combination of meat and vegetables cooked in liquid over time, and even in Ireland there are many variations. Some are served with a broth, others are thick. Some made with lamb, others beef. What follows will be my own version, which is hearty and delicious, the perfect autumnal food. (Even for those, such as I, who would eat red meat rarely.) Before getting on to the recipe I will write a bit about the history of this dish in Ireland. No one today would think of an Irish stew without potatoes, but this vegetable only became established in the 17th century. Certainly since that time, the potato has been identified with Irish culture above all others, for good or bad. Today, many cooks would stop adding vegetables after carrots and onion, though parsnips would have been a legitimate ingredient from far prior to the arrival of the potato from the New World. And then there is a matter of lamb. Today this meat is indelibly associated with an "Irish" stew, even if few people previously would have been rich enough to include this in a dish. Mutton, yes, an older tougher animal that requires slow cooking in a pot. But just try to find anything labelled mutton in an Irish butchers! It's as though the word were forbidden. Only in halal meat shops is it properly labelled. Foods go through phases, and are often strongly aspirational. People want to eat what those who are richer and of higher class eat. And lamb (as opposed to mutton) is one of those things. In early (pre-potato) Irish history there were no ovens. There were two ways of cooking food over an open fire: in a cauldron, or on a spit. Now to me, it is wasteful to cook lamb in a cauldron when one has a spit handy. Stewing is for older meat. And originally this would have meant beef. Cattle were raised primarily for their milk and cheese, summer foods. But come winter, older animals were slaughtered and salted, to last through the winter. In fact, this recipe is designed to emulate the best Irish stew I ever had. Remarkably, this was at an art gallery in Salt Lake City, Utah. I don't remember the name of the cafe, but I remember the food! Obtain some naturally fed and pastured beef (where you can). It should be cut into bite-sized pieces, or do this yourself. What is sold as "stewing beef" is likely round or chuck. The best meat will be lightly marbled, so that it gets tender on cooking. As for quantity, about 400g is enough for 4 people. This may seem wrong to those accustomed to too much meat in their diet. The photo above shows the amount of meat in proportion to the other ingredients. Grab 3 russet potatoes, peel them, and slice into eighths. Chop one large onion (or 2 medium specimens), medium fine. Peel two carrots (only if necessary, since the skin has more nutrients) and slice into disks. Ditto for two small (or one large) parsnips. Finely dice three large garlic cloves. Locate some good olive oil. 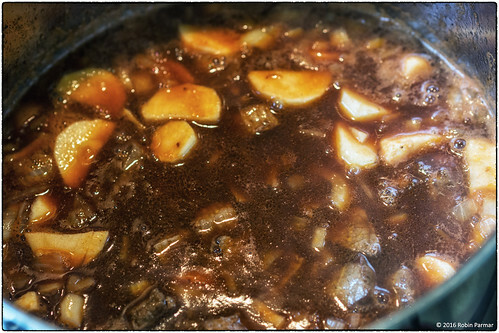 Beef stock can be made, obtained, or substituted with something made from cubes. The latter is the most convenient, and is fine by me, so long as you carefully avoid those brands with artificial ingredients or too much filler. I would use two cubes, which means the result is salty enough that no salt needs to be added to the recipe. If you are using proper beef stock, you may need to augment with crushed sea salt. Tomato paste can be obtained in little tins or squeeze tubes. Locally the tubes are 140g in size, and I use about a third. The stew becomes a totally different dish if you use some other form of tomato or avoid it entirely. For heaven's sake be sure there is nothing extra in the tomato paste. It should contain only tomatoes and salt. Too many pre-made ingredients add sugar. Buy some nice stout. Most recipes call for Guinness, but their regular stuff is inferior to either Murphy's or Beamish. (They have a great marketing department, however.) Just because you are cooking with it, don't think you can get away with bad beer. (The same goes for wine in dishes that call for wine.) It will hurt your karma. Those into their beer will know that Guinness makes other brews. Their Dublin Porter is excellent for this dish. It's a lot fizzier and somehow that works. Anyway, once you have a pint of stout, drink half while preparing the vegetables and reserve half for the stew. Or, do the obvious thing and buy more than one pint! There are those who will complain about putting alcohol into food. That's because drinking and eating have long been partitioned activities in Ireland. If you drink you don't eat, and vice versa. Let's just get over that. The alcohol boils off in any case, but flavour remains. And it seems to help tenderise the meat. Using wine results in a totally different stew. It's not a flavour used here. Worcestershire sauce is key due to its secret ingredient: tamarind. This acidity is essential. Buy Lea & Perrins. There are no other brands. How much you add is up to you, but I find that four or five dashes is enough. The herbs you use can vary but should start with 2 bay leaves. Usually I leave it at that. Strong herb flavours are not desirable. You could add a little dried thyme. Have on hand some ground black pepper and chopped fresh parsley as garnish. Pepper should never go into cooking at an early stage (rare exceptions apply). 2. Add the beef in batches, so as not to crowd the pan. This is important! Add too much meat at once and you will be steaming, not browning. Do not stir, but let the meat cook on one side, then turn. Continue until all sides are browned. Remove. 3. Scrape the pan of any sticky goodness, but reserve it in with the remaining oil. Add the garlic and onion. Cook a couple minutes, stirring near constantly, until translucent. 4. Add the beef stock, stout, tomato paste, dried herbs, chilli, and Worcestershire sauce. Stir and bring to the boil. 5. Add the carrots, and allow the mixture to reach temperature again (bubbling away). Repeat for parsnips, then beef. 6. The liquid should just cover the ingredients. If not, top up with boiling water. Mix well. The photo above shows the stew at this stage. 7. Reduce heat, cover the pot, and simmer for about an hour, stirring rarely. You know when it's ready because the vegetables will be tender, but not falling apart. 8. Add the potatoes, simmering uncovered for about 40 minutes, until they are tender. You may wish to add more boiling water, depending on how thick you like the finished stew. 9. At this point you can test for flavour. Add salt only if necessary. Remove the bay leaves. 10. Serve and dress on the plate with ground black pepper and fresh parsley (see the first photo). Serve with stout or red wine, depending on your preference. This can feed 4 if you have some crusty bread on hand. In that case, I recommend more broth. 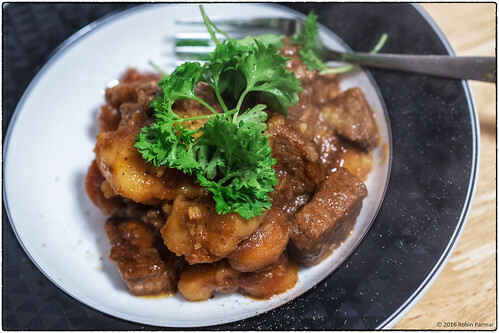 The brothy version of this stew can be reheated, but the thicker version does not keep well, nor warm well. That's why my recipe is smaller in portions than many. You want to finish it all at one sitting. And you will want to! "A History of Irish Cuisine (Before and After the Potato)" by John Linnane, a lecturer at Dublin IT. Online here.